I am an artist who has been working in the fabric industry for 35 years. A Master of Fine Arts Degree prepared me for a fulfilling life of facilitating the creativity of others. The emphasis in grad school was painting, drawing, ceramics and teaching. I taught art at three universities before embarking on a career in the fabric and sewing field. Teaching is the way that I share my love of the fabric arts. I teach internationally at the International Quilt Festival, Quilt Market and for shops and guilds and I was named Dollmaker of the Year in 1997. I teach options for individual interpretation rather than strict rules. I believe that inspiration, then information. is the way to unlock creativity. Lots of “show-and-tell” samples are an integral part of my seminars and trunk shows. Designing fabric for several different companies over the past 30 years has been rewarding. I have designed thousands of fabrics for quilters over the years. My husband, Lynn, and I also have a publishing company of fine books and patterns and a history of opening interesting quilt shops in unlikely places. 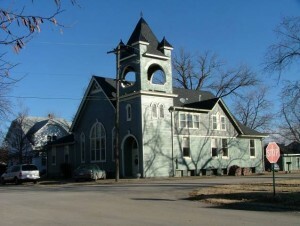 The Kansas Quilt shop was located in an 1890′s church building. 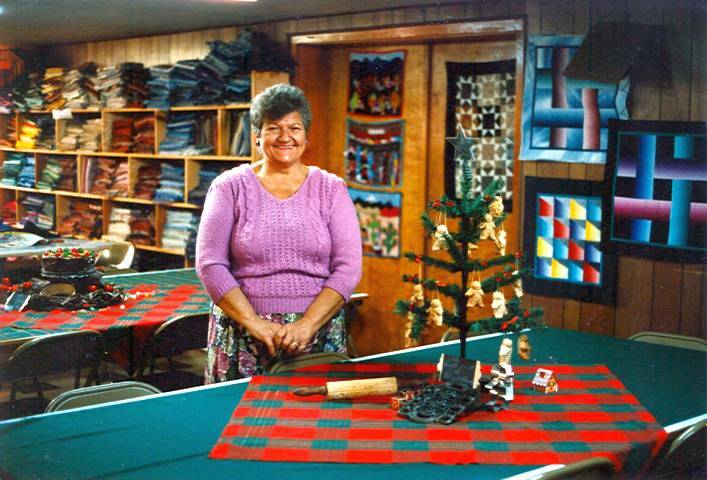 The first shop was “The Osage County Quilt Factory” in the tiny town of Overbrook, Kansas. The motto of Overbrook is “Don’t Overlook Overbrook”. 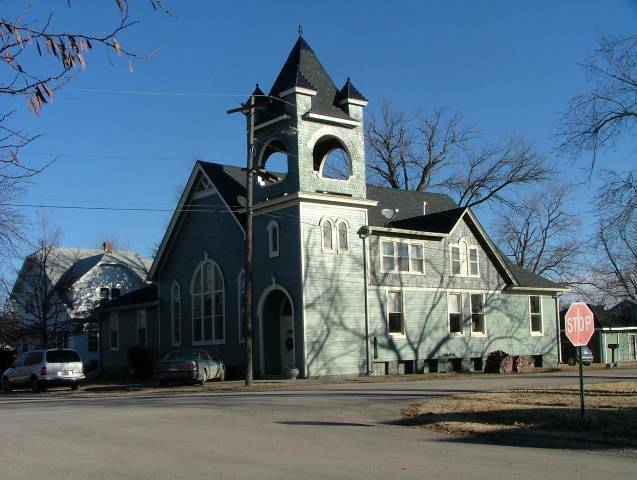 The building was an 1890′s church building, complete with 20 foot ceilings, 7000 square feet of space for the quilt shop and the growing publishing company which employed 15 people. 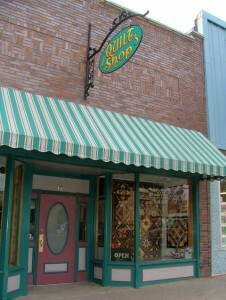 That store was one of the first “Top Shops” in the USA. We had a lot of parties at the Osage County Quilt Factory. My Mom, Cleda Cox ready for a party at OCQF. My Mom, Cleda Cox, would cook gourmet meals for tour groups that came to shop. We also had huge Christmas open houses with “Mom’s cooking”, visiting crafters selling gift items and a huge selection of handmade ornaments for sale. Inside the Kansas quilt shop. Lynn built fabric benches that looked a lot like church pews. The stage in the sanctuary made a great display area for quilts. 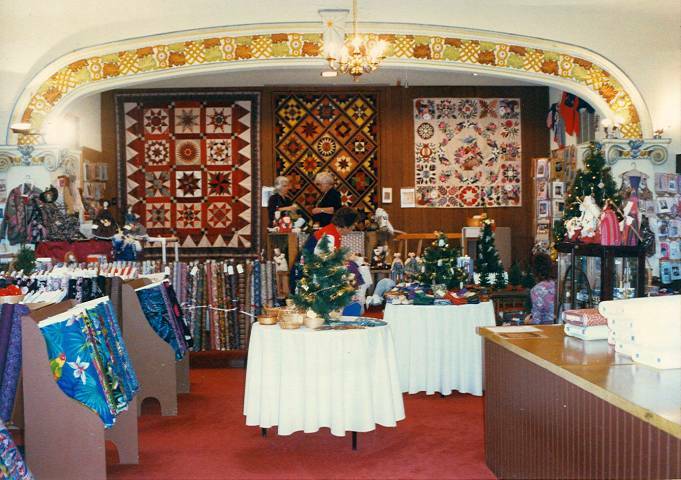 As a preacher’s daughter, I felt quite comfortable having a quilt shop in a church building. The next shop was in a small log building in Dolores, Colorado. 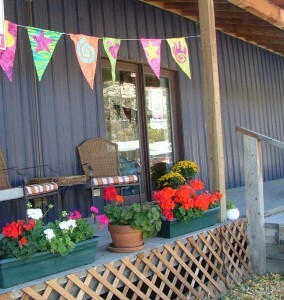 The space was originally rented for office and warehouse use so we could ship orders while we built our dream house. We camped in a tent one summer while building and then borrowed a travel trailer for the colder weather. A local quilter, Deanna Truelson, who was familiar with my patterns, insisted that I open a quilt shop in Dolores. She and her friends started shopping as we were moving into the log cabin on the main street. We had a thriving mail order catalog at that time with a complete inventory of bolts of the fabrics that I design, notions for dolls and quilting and lots of interesting gift items that I sell in booths at quilt shows. 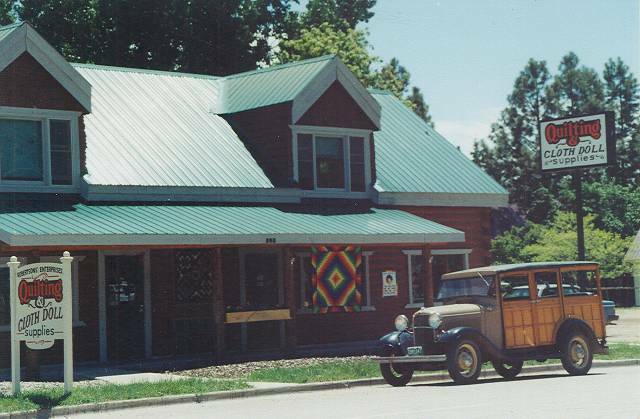 There was so much tourist traffic on the road to Telluride that I hired my first employee, Valerie LeRoy right away to help with shipping, book keeping and in the one room quilt store. In five years, we kept growing and rented the rest of the building to make room for more fabric and inventory. The motto for that shop was ” Lime Green Is A Neutral” We had lots of wild, edgy fabrics and bright samples. 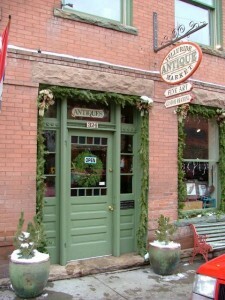 The Telluride store was located on a historic Main street. There was had a small shop for nine months in Telluride, Colorado which was in a historic house on main street. The quilt shop was mixed up with a great antique store and it was fun to put fat quarters into beautiful old furniture for display. That shop just didn’t do much except break even, so we closed it. But it does look good on my resume! Fabrics displayed with the antique furniture in the Telluride store. 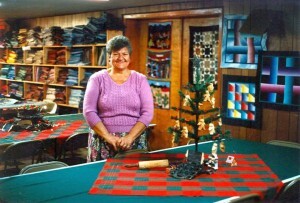 I invited all of my friends from the quilt and dollmaking field to come to Dolores and Cortez to do inspiring workshops. Having national teachers come to the isolated four corners area inspired a lot of new creativity and the local quilt shows became larger and lots of wonderful quilts and cloth dolls are being produced here. 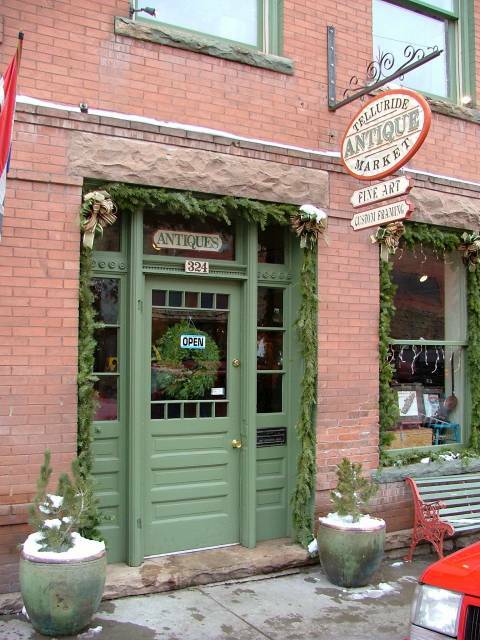 Finally, we had to move to a larger historic store front in downtown to Cortez, Colorado. 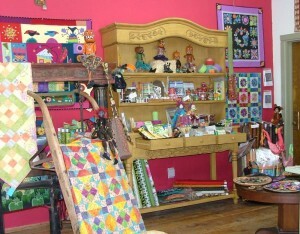 I had a great first year in Cortez, then sold the shop in 2006. Now, my time was spent traveling for Bali Fabrics as art director,designing fabric for Bali Fabrics, Clothworks, U.S. Indo Sales & Richlin. I always am designing new patterns and teaching. 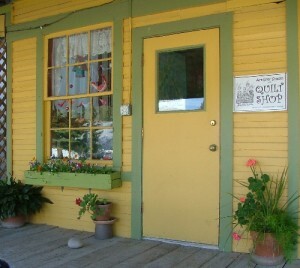 The latest quilt shop was The Art Girl’s Studio & Quilting in an old warehouse in the main drag of Dolores. It all started with a yard sale two years ago that got out of control. Bali Fabrics went out of business and my finances were not so good. So, while I searched for a new fabric designing job, I started selling all my batik quilt samples at the Ginger Jar location during the River Days festival in Dolores, Colorado. Ginger and Silvia offered me an empty room for the summer to continue the “ARTY Garage Sale”. 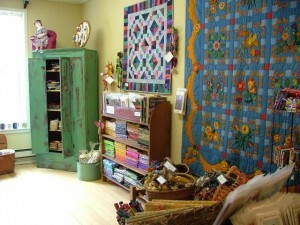 Long story short, I teamed up with several freinds and another quilt shop was created. 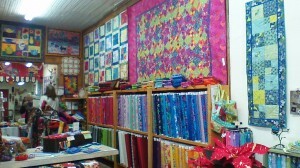 This shop was a colorful jumble of bright fabrics and quilts that everyone called “the happy place”. We carried Kaffe and batiks . We made lots of quilts and gift item for the tourists. The shop closed after five years and Virginia is now back to the studio full time designing new projects for the website. She also teaches if the location is close enough to drive. (Flying is no longer a commercial option!) Follow Me on Facebook to see what is new.